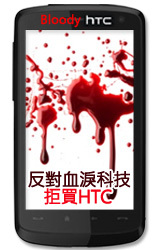 Bad day to be an HTC fanboi like me. LabourStart have a campaign running in support of YFOTU, the union of workers in Taiwanese mobile phone touchscreen manufacturer YFO. There have been some grim reports of working conditions at the company, with child labour, forced overtime and poor safety. After seeing reports of bad conditions at iPhone component factories, I was feeling all smug with my non-union-busting HTC TouchHD (the third HTC handset I’ve had now, and a very nice one too), but it looks like mine may be just as bad. YFO have dismissed a number of union reps and members recently, which the union belives is in contravention of employment law. Please take a moment to sign the LabourStart email petition, and check out the Twitter petition to HTC too. There are also Twitter petitions aimed at Google, LG and Samsung, who also use this supplier for touchscreens. Also check out the YFOTU union’s blog, which has a lot of information in English. Thanks a lot for writing about our campaign! I hope the brand names including HTC would see the power of the international solidarity and demand YFO as their supplier to reinstate the union members and obey the law. What the union is campaigning for is only basic labor rights. It’s so sad that in a somewhat advanced country in Taiwan, we still have sweatshop factories. Thank you for blogging about this to the other side of the world. Knowledge is power and I’m happy to see we’re using it to the advantage of the disadvantaged even from afar. Great job!